Save on our regular flavors in irregular shapes! When you make candies the old-fashioned way, like we do, some pieces always end up a little larger, smaller, or differently-shaped than the rest. We've loose-packed these tasty tidbits in bulk trays, and passed the savings on to you for your at-home enjoyment. Kosher. INGREDIENTS: Aplets & Cotlets Value Pack: sugar, corn syrup, walnuts, modified corn starch, fruit juice from concentrate (apple & apricot), pectin (pectin, disodium diphosphate, sodium polyphosphate, dextrose, dicalcium phosphate), natural flavors, sodium citrate, citric acid, malic acid, soy lecithin. INGREDIENTS: Fruit Delights Value Pack: sugar, corn syrup, nutmeats (may contain: walnuts, pecans, macadamias, cashews, almonds, hazelnuts, pistachios), modified corn starch, pectin (pectin, disodium diphosphate, sodium polyphosphate, dextrose, dicalcium phosphate), fruit [may contain: fruit juice from concentrate (peach, strawberry, apple, blueberry, raspberry, cranberry, cherry, apricot, boysenberry, grape, lime, black currant, pomegranate, watermelon), cranberries, candied orange peel (orange peel, sugar, citric acid), dried cherries (cherries, sugar, sunflower oil), cherries, pineapples, raspberries, blueberries, blackberries, dried apricots (contains sulfur dioxide to retain color), strawberries, apples, pears, papayas, guavas, passionfruits, apple flake (apples, calcium stearate), mango, candied ginger (ginger, sugar), peaches (with ascorbic acid & citric acid to retain color), lemons, kiwi, cantaloupe, pomegranate], dried coconut (contains sodium metabisulfite to retain color), natural & artificial flavors, sodium citrate, citric acid, malic acid, yellow 5, yellow 6, red 40, blue 1, soy lecithin. INGREDIENTS: Locoum Delights Value Pack: sugar, corn syrup, nutmeats (walnuts, pistachios, almonds), modified corn starch, pectin (pectin, disodium diphosphate, sodium polyphosphate, dextrose, dicalcium phosphate), apricot juice concentrate, apricots, natural flavors, sodium citrate, citric acid, malic acid, black carrot extract (for color), soy lecithin. INGREDIENTS: Tropical Delights Value Pack: sugar, corn syrup, nutmeats (macadamias, cashews), modified corn starch, pectin (pectin, disodium diphosphate, sodium polyphosphate, dextrose, dicalcium phosphate), fruit [may contain: fruit juice from concentrate (apple, lime, cantaloupe, pomegranate, watermelon), pineapple, papaya, guava, passion fruit, mango, candied orange peel (orange peel, sugar, citric acid), apples, apple flake (apples, calcium stearate), candied ginger (ginger, sugar), lemons, kiwi, grapefruit)], may contain dried coconut (with sodium metabisulfite to retain color), natural and artificial flavors, sodium citrate, citric acid, malic acid, yellow 5, yellow 6, red 40, blue 1, soy lecithin. INGREDIENTS: Sugar-Free Fruit Delights Value Pack: maltitol syrup, nutmeats (walnuts, pecans, macadamias, cashews), sorbitol, pectin (pectin, disodium diphosphate, sodium polyphosphate, dextrose, dicalcium phosphate), maltitol, modified cornstarch, natural and artificial flavors, sodium citrate, citric acid, malic acid, red 40, yellow 5, yellow 6, blue 1, soy lecithin. INGREDIENTS: Classic Fruit Chocolates Value Pack: sugar, corn syrup, nutmeats (walnuts, pecans, macadamia, cashews), chocolates liquor, modified corn starch, fruit [fruit juice from concentrate (may contain: strawberry, raspberry, cherry, apricot), dried fruits (may contain: candied orange peel, apricots (contains sulfur dioxide, a preservative), cherries (cherries, sugar, sunflower oil), raspberry, guava, pineapple, papaya, passion fruit], may contain dried coconut, cocoa butter, milk, pectin (pectin, disodium diphosphate, sodium polyphosphate, dextrose, dicalcium phosphate), butter oil, natural & artificial flavors, soy lecithin, sodium citrate, citric acid, malic acid, yellow 5, yellow 6, red 40, blue 1. INGREDIENTS: Sugar-Free Fruit Chocolates Value Pack: maltitol syrup, sugar-free chocolate coating (maltitol, chocolate processed with alkali, cocoa butter, milkfat, soy lecithin [an emulsifier], acesulfame potassium, sodium caseinate, natural and artificial flavors), nutmeats (walnuts, pecans, macadamias, cashews), sorbitol, pectin (pectin, disodium diphosphate, sodium polyphosphate, dextrose, dicalcium phosphate), modified corn starch, maltitol, natural and artificial flavors, sodium citrate, citric acid, malic acid, red 40, yellow 5, yellow 6, blue 1, soy lecithin. INGREDIENTS: Nut-Free Fruit Smoothees Value Pack: sugar, corn syrup, modified corn starch, pectin (pectin, disodium diphosphate, sodium polyphosphate, dextrose, dicalcium phosphate), natural & artificial flavors, fruit [may contain: fruit juice from concentrate (peach, strawberry, apple, blueberry, raspberry, cranberry, cherry, apricot, boysenberry, grape, lime, pomegranate, watermelon), cranberries, candied orange peel (orange peel, sugar, citric acid), dried cherries (cherries, sugar, sunflower oil), cherries, pineapples, raspberries, blueberries, blackberries, dried apricots (contains sulfur dioxide to retain color), strawberries, apples, pears, papayas, guavas, passionfruits, apple flake (apples, calcium stearate), mango, candied ginger (ginger, sugar), peaches (with ascorbic acid & citric acid to retain color), lemons, kiwi, cantaloupe, pomegranate], may contain dried coconut, sodium citrate, citric acid, malic acid, yellow 5, yellow 6, red 40, blue 1, soy lecithin. INGREDIENTS: Nut-Free Sparklers Value Pack: sugar, corn syrup, pectin (pectin, disodium diphosphate, sodium polyphosphate, dextrose, dicalcium phosphate), fruit [may contain: fruit juice from concentrate (peach, strawberry, apple, blueberry, raspberry, cranberry, cherry, apricot, boysenberry, grape, lime, pomegranate, watermelon) cranberries, candied orange peel (orange peel, sugar, citric acid), dried cherries (cherries, sugar, sunflower oil), cherries, pineapples, raspberries, blueberries, blackberries, dried apricots (contains sulfur dioxide to retain color), strawberries, apples, pears, papayas, guavas, passionfruits, apple flake (apples, calcium stearate), mango, candied ginger (ginger, sugar), peaches (with ascorbic acid & citric acid to retain color), lemons, kiwi, cantaloupe, pomegranate], may contain dried coconut, natural flavors, sodium citrate, citric acid, malic acid, soy lecithin. INGREDIENTS: Sugar-Free Nut-Free Fruit Smoothees Value Pack: maltitol syrup, sorbitol, pectin (pectin, disodium diphosphate, sodium polyphosphate, dextrose, dicalcium phosphate), maltitol, modified corn starch, natural and artificial flavors, sodium citrate, citric acid, malic acid, yellow 5, yellow 6, red 40, blue 1, soy lecithin. I discovered this brand from my monthly emmbership box of snacks froma round the world. These 'Turkish delights' were so great i had to buy them. I absolutely love these bulk saving bites. Who cares what they look like? They taste so good and save you money. What more can you ask for? I buy them all the time. Great idea. I don't care what the shape. I love Aplets and Cotlets. I'm disabled, on fixed income, so bulk order is perfect for me. I gave up on buying Aplets and Cotlets here in Alaska; they seem stale, dried out. Guess I got spoiled while growing up in Washington. My best friend went to college at Central. Stopping in Cashmere was always a destination of delight. Finally dawned on me to just order some right from Liberty Orchards. I know they'll be fresh. Just the thought of the taste makes my mouth water. Thanks for being there. We look forward all year to getting Aplets and Cotlets from our relatives. We finally caved and decided to order them ourselves to make sure we had extra! The value pack was fresh and delicious! This might have to become more than just a holiday treat! I wish you sold a box of just Cotlets! they re my fave! I haven't had any of these candies for several years, but when I got internet, I Googled APPLETTES And COTTLETTES to get some . I'm not allergic to any thing found in any kind of candies, yet I like these because they're good and not because of needing to avoid allergins. This is what i buy for myself, a surprise in each bite. Most everything else i buy goes for gifts, to the workers at Good Will , the library employees, my mailman, my newspaper delivery person, family and friends. All love it ! This is my all time favorite (along with the chocolate aplet and cotlets value pack) ranks in my top 5 of my all time favorite products! Our daughter has special needs, and extreme dietary allergies. Your product is one of the very few that she can enjoy without having serious medical issues (seizures, etc) because you do not use any chemicals, artificial colors/sweeteners, or chemical preservatives. We are all delighted that your product can allow her to have a taste of something wonderful (Heavenly), that so many others take for granted. Thank you for your service, for your outstanding product and for allowing my family to enjoy such an incredibly wonderful treat together! We are your customers for life! Excellent value. I don't need them to be pretty to b good. I always buy Aplets & Cotlets in the bulk packs for myself & my family since you started offering them. I can buy more this way. 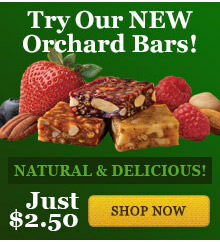 Thank you Liberty Orchards for the call regarding our order. We appreciate your effort to straighten out the order. Please remove my last comment. Sincerely, Jessie Liberty Orchards Reply: Thanks, Jessie. Our goal is to make you happy with us, and we thank you for letting us know that we've done our job. My daughter and I just love this box, not only for the pricing, but because if you want a smaller piece you can have it or if you prefer a larger piece, it's there. Love this refreshing treat. Aplets were a wonderful treat when I was growing up in Cashmere. I remember touring the plant when I was in grade school. I still order Aplets and Cotlets as a special gift for friends. Liberty Orchards Reply: Thanks for your MANY years of patronage. The school kids still stop by our store every day for free samples! What more is there to say! Value packs are the way to enjoy even more of these treats at a more affordable price. A perfect balance of flavor and sweetness. My packages arrived fresh and were quickly devoured by my hungry crew. They'll be expecting that kind of treat again, and I won't be disappointing them. Thank you for a great tasting product. Service was exceptional and candy is delicious! Same wonderful taste as the perfectly shaped cotlets but at bargain prices. Excellent fruitiness mixed with enough nuts for every delicious bits. 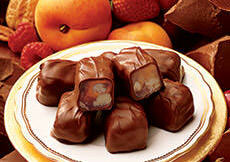 I ordered the Value Pack of the Chocolate Fruit Delights! I have never tasted anything better! I have had chocolate from other countries too! The taste and texture are perfect! My box won't last long! I actually LOVE the irregularities of the Value Packs I ordered for a party as a more homemade look. At the end of the event, there were only 2 pieces left of the 2 boxes. I also appreciate the more efficient packaging as being more environmentally friendly. My only wish would be for a compostable try insert instead of plastic. Love these and still very nice to even serve to guest. Great value!! We love the sugar free treats & the tropical fruit treats are our new favorites. I have had the bulk candies before and enjoyed them greatly. I think they were bagged. This was my first experience with the chocolate covered candies, and oh my! The only saving grace was the limited quantity. I must see if you have a production facility tour with "free" samples. I would love to taste all your goodies. Who cares about the shape? It's the taste that matters and these taste superb! Powdered sugar is messy and adds calories, but not taste. Omit coating or offer choice without the powdered sugar. These are completely addictive, and Aplets and Cotlets are my favorite candy! There is nothing like them on the market. 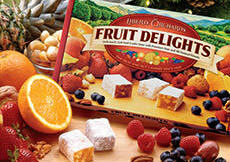 The assortment of flavors in the Fruit Delights Value Pack is excellent, and all are very tasty. The only reason I rated them as 4 instead of 5 is that I prefer a slightly firmer product. The Value Pack Aplets & Cotlets are delicious and firm. The "irregularities" are very slight and do Not make the Aplets & Cotlets unattractive. The flavor is superb. Expect a smaller box compared to the traditional rectangular one. There is no guide to tell you what the pieces are, but part of the fun is trying to figure it out. And for the cost it is definitely worth getting. My wife's candy choices were EXTREMELY limited--She is allergic to nuts and chocolate--Aplets are the ANSWER--GOOD candy without the penalty of alergy that taste as good as they look! Liberty Orchards reply: Thanks for the compliment, Ernie. 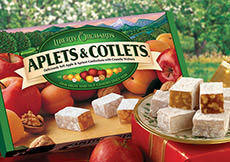 But please note there are nuts in Aplets & Cotlets, so our delicious "nut-free" confections would be best for your wife. I've bought or ordered Aplets and Cotlets and Fruit Delights for gifts for a number of years, and because I like them too, get Value Packs for myself. This year I was disappointed because in the A&P pack were many other than the A&P pieces I expected, some even without the nuts I love -- namely lemon, and in the Fruit Delights the same, plus what must have been raspberry, no nuts but what seemed like seed residue. The nutless pieces were very good, but because they were not in either case A&Ps or what I could identify as Fruit Delights, I must express my disappointment. And I hope nothing is of the sugar-free variety because I have a sensitivity to those sweeteners! Liberty Orchards reply: Thanks, Judy. We're sorry that some of the pieces didn't have nuts, but this can happen with Fruit Delights Value Pack. In our Value Packs, we take all the odds and ends from our production and pack them in Value Packs at a lower cost to our customers. Some of our Fruit Delights are made without nuts, and irregulars from those products can be found in the Fruit Delight Value Pack. Also, when we're packing our fancy boxes, our packers our instructed to set aside any piece of candy that doesn't feel like it has nuts in it. We use lots of nuts in our production, so it doesn't happen too often, but these set-asides would also be packed in our Value Packs. Finally, there shouldn't be anything but Aplets or Cotlets in the Aplets & Cotlets Value Pack. 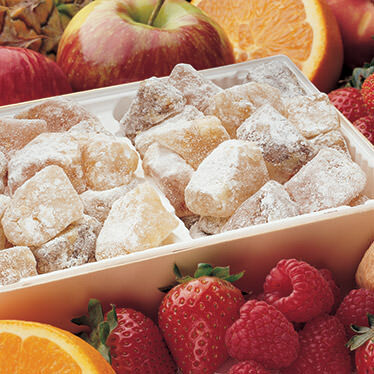 Since all our candies look alike with the powdered sugar coating, and since all our candies are packed on the same lines, it might be possible for a Fruit Delight or two to get mixed in with a batch of Aplets or Cotlets. It would be very rare, but it could happen. We try to be careful, but we're not perfect! Thanks again for your review. Unless you're giving this as a gift to someone "picky" you get more bang for your buck buying these! Same candy, same quality, just not perfectly shaped - as if your stomach cares about their shape!! For a truly value minded shopping experience avoid the overpackaging and get a surprise assortment of Fruit Delights at a great price! The candies are still the same Highest Quality confectionery one would expect from Liberty Orchards and the absence of extra plastic trays and overwrapping is great for the environment.You won't be dissatisfied with your purchase and may get to taste a flavour you've only read about in the catalogue...like Boysenberry Pecan or Banana Walnut!- It's always a rewarding treat for yourself so buy the Value Packs with abandon- you'll be glad you did!